Damn son. Nice card for Wild. I still don't know if I'm a believer in secret paladin emerging this format, but something like this makes me give it a second thought. I hated secret paladin before. I hate him now. 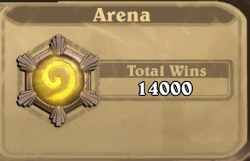 I will hate it until i uninstall HS. Yo dog, i heard you like Secret Paladin in Wild. This and Autodefense Matrix and Repentance. Sick combo's. In all fairness, all other secrets are great if triggered twice. I can't say for sure but I have a feeling this is really good. Your opponent will need to use spell-based hard removal for it, otherwise they're just going to fall massively behind, and by using spell-based removal, all of Paladin minions are going to get +4 health. The effect is awesome by itself; with Mysterious Challenger this could get bonkers with the value. As a Paladin player, the secret archetype doesn't really excite me... but I guess if I pull this I'll give it a shot. Not denying it may be a strong card (even though there are only currently a few secrets that get value off of this: Eye for an Eye, Noble Sacrifice, Redemption, Hidden Wisdom, and the new Never Surrender! ), but I am really hoping for some dragon support for the other legendary. Wow, this is a very impactful card. I didn't have much faith in the new secret, now I see it, +4 health board buff, THAT is significant. Double redemption, double get down, that's just really good tempo with all the played secrets. wow, now that's a card. Secret Paladin is now fully playable I guess. Question; can this effect stack up? As a Paladin player, the secret archetype doesn't really excite me... but I guess if I pull this I'll give it a shot. 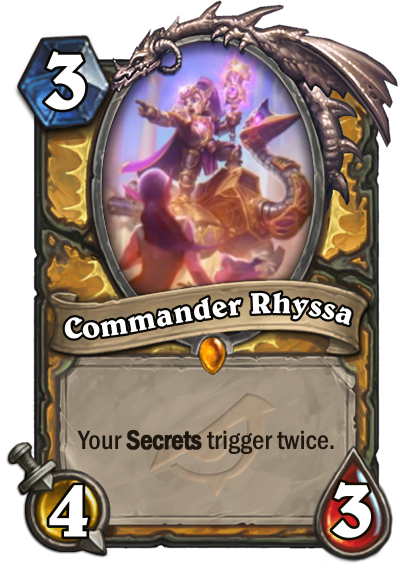 Not denying it may be a strong card (even though there are only currently a few secrets that get value off of this, Eye for an Eye, Noble Sacrifice, Hidden Wisdom, and the new Never Surrender! ), but I am really hoping for some dragon support for the other legendary. Pretty sure it work's with Redemption as well. Probably resummons the minion twice, like any revive spell in priest would if cast twice. But I might be wrong. Well that is a much healthier card than Mysterious Challenger if you ask me, it's not just play the card and win the game, this card requires an active brain at least. It looks very powerful but not frustrating to play against. This is a nice booster for the wild secret paladin. It has a very aggressive body and it;s not understated. Could be run in an odd secret paladin, if this becomes a thing in wild.